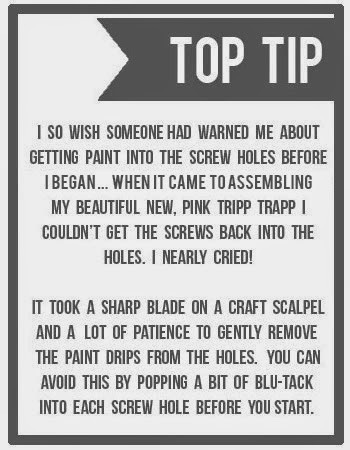 Altering your Tripp Trapp in any way invalidates your warranty, so please take that into consideration before going crazy in the paint aisle. If you are lucky enough to stumble across a Tripp Trapp in a charity shop, thrift store or boot sale (it is rare but it does happen), it's fate and it's your duty as a Stokke Lover to mount a rescue and provide it with a new and happy home. Second hand bargains on ebay and Gumtree are still out there, but search in your local area for 'collection only' listings as they tend to be cheaper. Before you get stuck in, give the paint you are planning to use careful consideration. 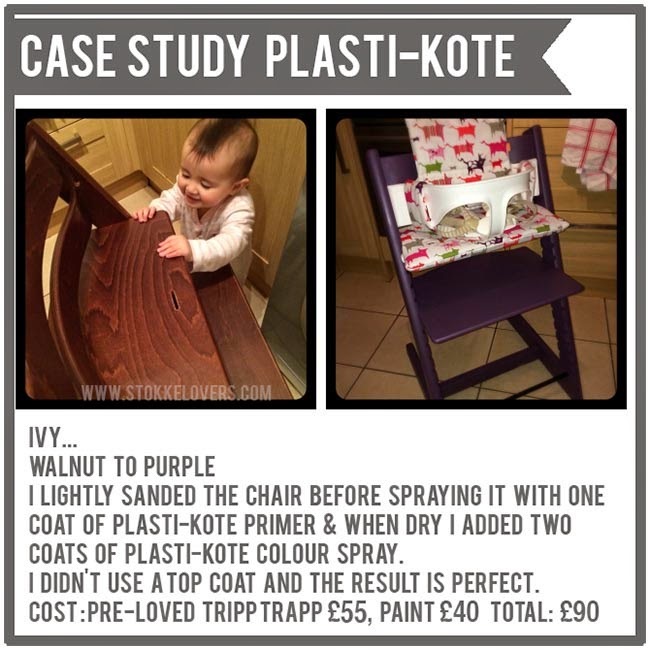 If your new Tripp Trapp is going to be in daily use, I would steer clear of chalk paints like Annie Sloan or Autentico. They might be all the rage, but they aren't made to withstand toddlers! For the best finish, go for a multi purpose spray paint. Painter's Touch and Plasti-Kote are both perfect with lots of colours to choose from. I wanted my Tripp Trapp to be the same bright pink as my office wall, so I used a tin of leftover satin emulsion and a paintbrush but you really can use anything. Just adapt the method below. Preparation is everything if you want your finished Tripp Trapp to look flawless. And, yes, I know you're excited but this really is the most important step. 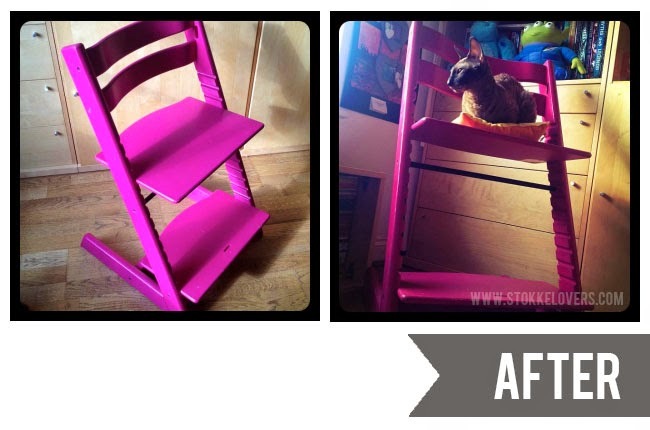 The first Tripp Trapp I painted was my original un-treated, natural, that was bought back in 2000 (before I worked for Stokke). It's been used daily since then and wasn't really in need of a makeover, but I had half a tin of bright pink emulsion that was yelling USE ME. Because my Tripp Trapp is un-treated it didn't need much prep, but if you are working on any other finish you do need to give it a good all over sanding before you begin. There are two reasons for this; 1. To remove any surface scratches and 2. 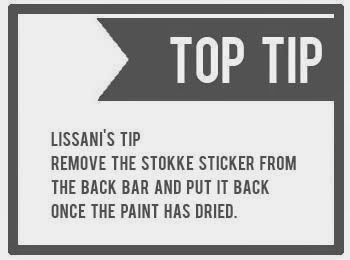 To ensure you can get it back together when you've finished painting it! After sanding, give it a thorough clean with a non abrasive cleaner like Sugar soap and then leave it to dry naturally, overnight if you have to, but don't rush! 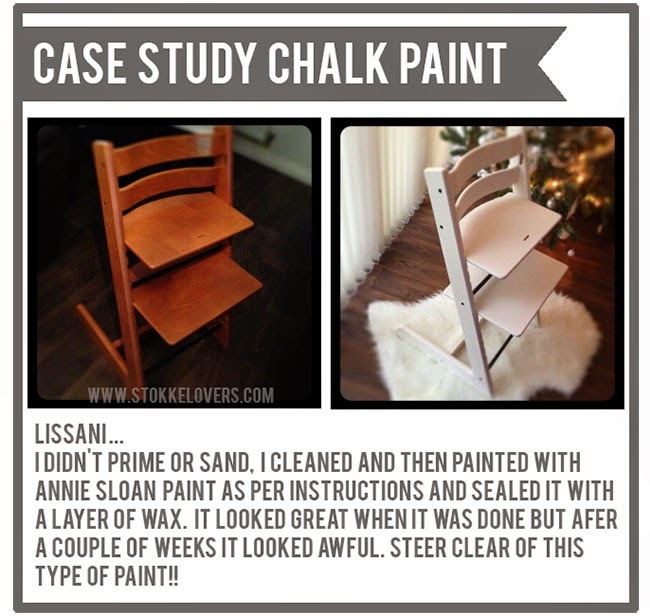 For a professional result you need to take your Tripp Trapp to pieces before painting it. Yes, it takes longer to paint, but skipping this bit of advice will come back to bite you when you want to make alterations as your child grows. I know this is obvious but put your screws and metal bars somewhere safe and away from your painting area! Both Painter's Touch and Plasti-Kote primer are perfect. If you aren't spraying, use a gloss roller, rather than a paintbrush to prevent those annoying brush strokes from ruining your project. If you are spraying, make sure you are in a well-ventilated area (and that your cat isn't hiding ready to join in and help without warning). Lay the pieces out so that they don't overlap and give your paint a really good shake. Apply a light even coat of primer to each piece and leave to dry. Apply your second light coat and then leave them dry completely before turning over and repeating on the other side. Don't be tempted to go crazy and use too much paint or you will have difficulty when it comes to assembling. Drying time will vary depending on your primer so read the label on the tin and follow the manufacturer's instructions. It needs to dry completely before applying your colour! You will need two or three, light coats of colour to get a professional, even finish. If two coats is all it needs, you don't need to add another. Apply your first coat of colour in the same way as the primer and leave to dry. 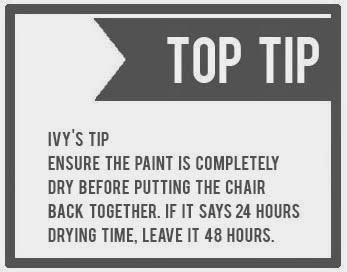 Apply your second coat (and third if needed), then leave for 24 hours to dry completely before turning over and repeating on the other side. There are lots of top coats to choose from, depending on the finish you want to achieve. I like Rust-oleum's Crystal Clear. Apply two light coats as above and leave to dry completely before assembling. Put your newly-painted Tripp Trapp back together again. If you need colour inspiration, check out the Pantone iPhone app it's awesome! 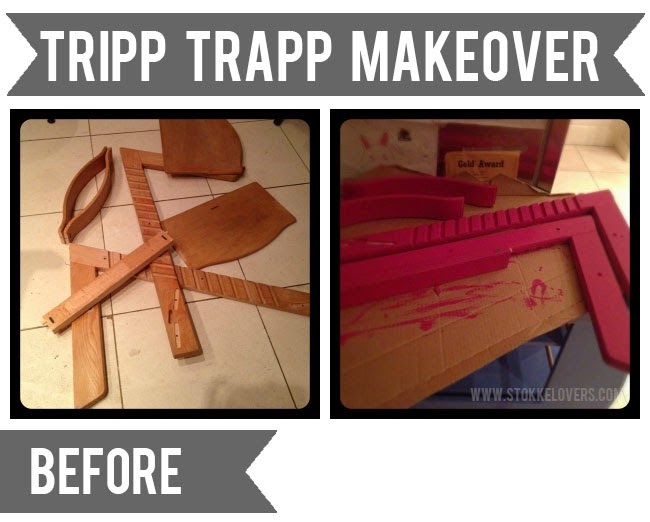 If you have before and after pics from your own Tripp Trapp makeovers, we'd love to feature them. 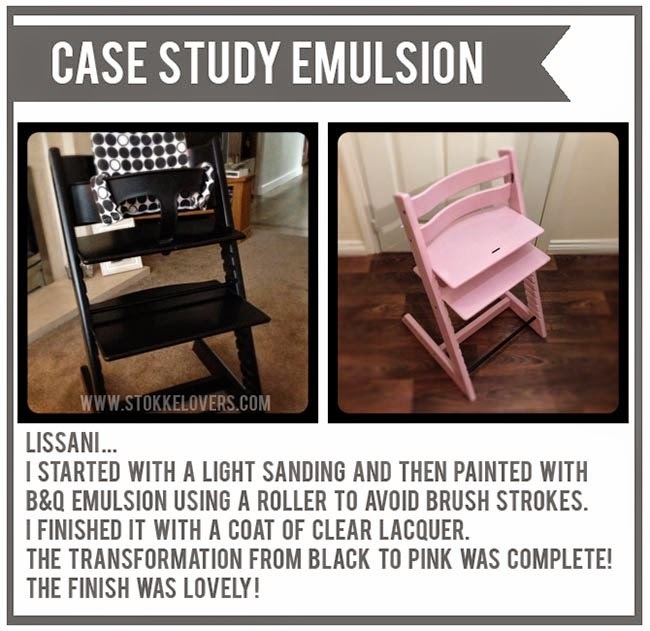 Pop us an email with your pics, what paint you used and any top tips you have and we'll feature you as a case study. A very big thank you to Lissani and Ivy for the case study pics. We've found a couple of additional Tripp Trapp makeover posts over at Mummy2Five and The Keifer Cottage. Thanks for these great tips! I'm hoping to score this used Tripp Trapp from Kijiji. Wish me luck!